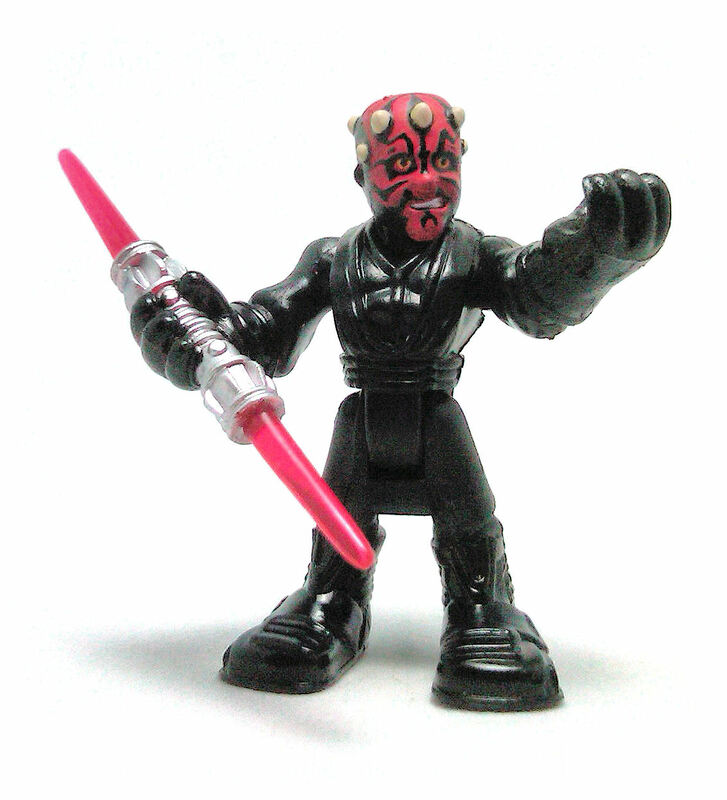 Darth Maul is sculpted in a super deformed, kid-friendly style that has a pretty reasonable level of detail, and even though the facial features are not too sharply defined, Maul gets some expression on his face thanks to an asymmetrical grimace that sort of conveys mild annoyance. Articulation is limited to a swivel neck, pegged hinge shoulders, swivel wrists and swivel hips, although both legs are molded as a single piece, so they can’t move independently of each other. 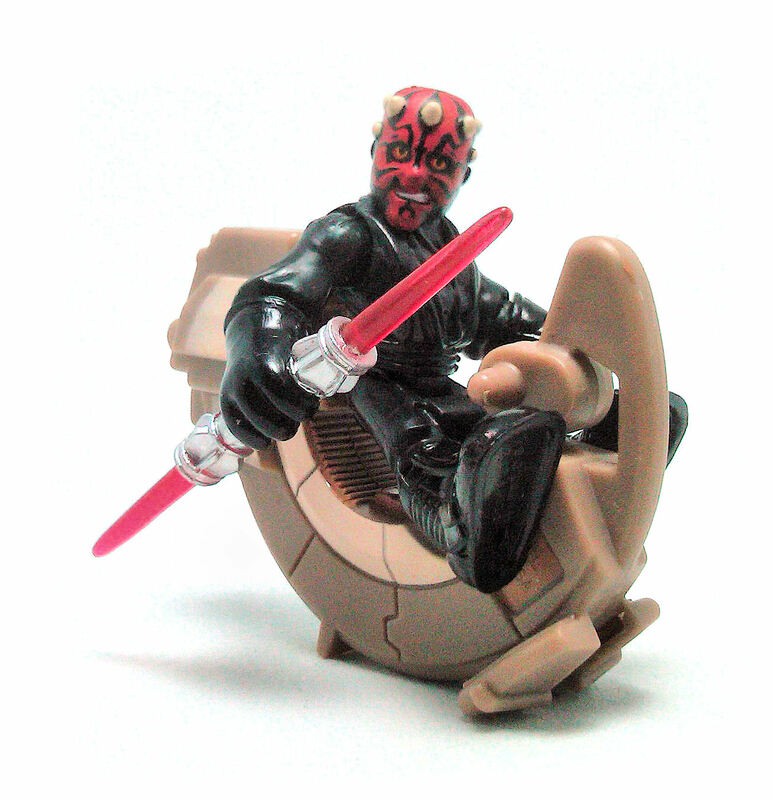 Darth Maul’s right hand is sculpted holding his double bladed lightsaber, but his left hand could hold a variety of accessories, speaking of which, Maul comes with the Playskool version of the Speeder Bike he used on Tattooine while searching for the Naboo fugitives. 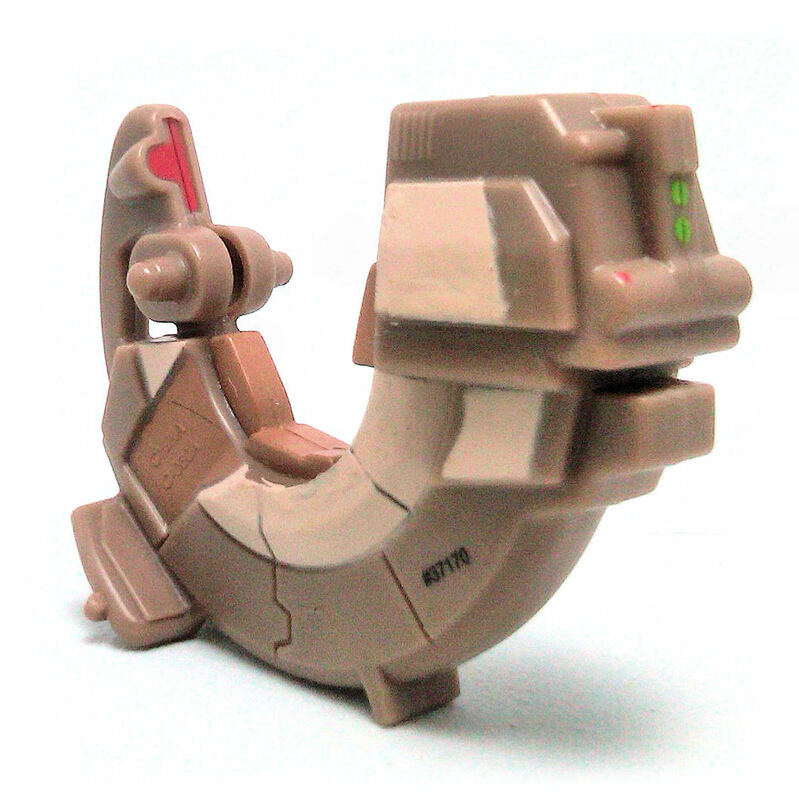 The Sith Speeder is the same piece that was used back in the Galactic Heroes line, as evidenced by the 2007 copyright date on it. The vehicle is nice and reasonably detailed, but since it was not really designed with the new Jedi Force figures in mind, Maul can’t really fit in there properly. The lower edge of his tunic prevents him from reaching the seat of the speeder and the handlebars are simply out of the reach of his left arm, although the figure can stay in place without much trouble grabbing the vehicle with the lower legs. 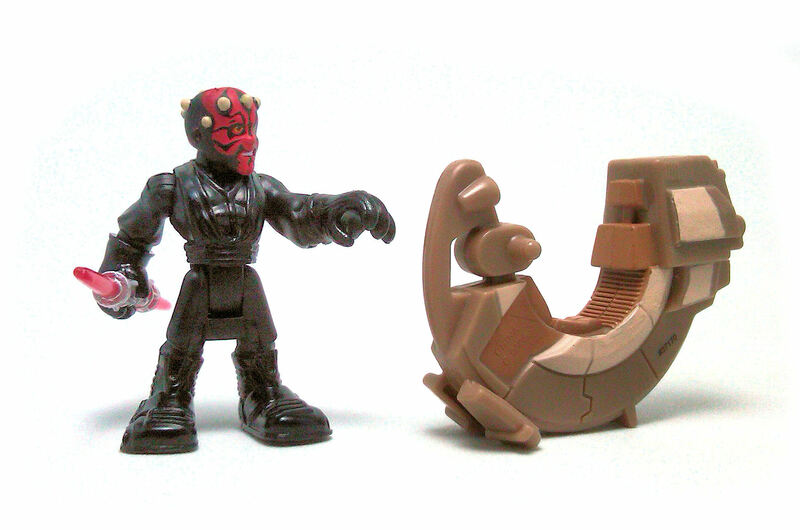 The overall paintjob on this set is average, with Maul sporting the more complex paint apps. Maul’s eyes are painted yellow with black pupils, and they show a thin red rim around them that look definitely Sith-like. 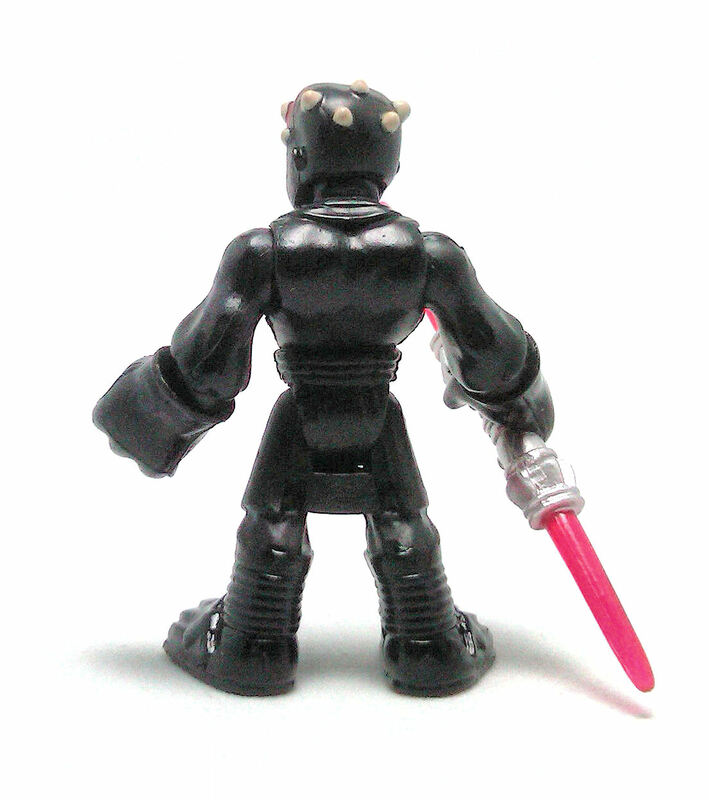 Maul’s boots and gloves are painted in glossy black, while the lightsaber hilt was decorated in silver. The horns on his head are painted ivory and the face tattoo is a fairly close approximation to what we saw on screen, although it was fairly difficult to find a good enough paintjob at the store. In the end I settled for the one set that required the minimal amount of touch up work for the figure. The Sith Speeder has a much more simple decoration, consisting basically in a few panels painted in a tan and copper, with minimal green and red accents on the console panel and the tail lights. There are small blemishes here and there, but overall the vehicle looks decent enough as it is. 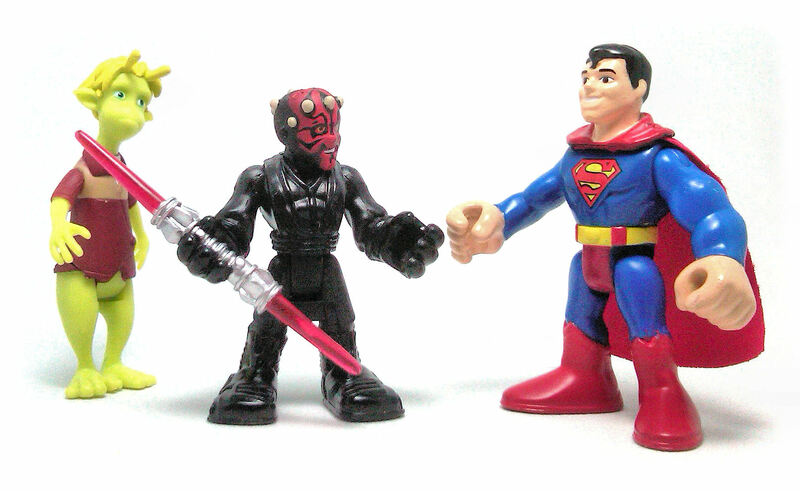 Although I actually liked both Darth Maul and the Speeder, I was somewhat disappointed by their lack of compatibility. As I mentioned earlier, these small sets offer a pretty good value, but I think it would have made more sense to wait and see if Hasbro would eventually offer Maul in the individual bag format.